The combine has wrapped up and we are now in the fast lane headed towards the NFL Draft starting on April 30th. Before we get there though we will be releasing a six part series, chronicling our top five players at each position, culminating in our final mock draft. This installment will focus on Linebackers and Tight Ends. Click here if you missed Part One – Interior Lineman, Part Two – Edge Rushers & Offensive Tackles, or Part Three – Cornerbacks & Safeties. A lot of people are letting Dawson fall down their boards because of his lackluster performance at the combine. That is one of my pet peeves when it comes to scouting of linebackers, middle linebackers in particular. Dawson flashes on tape, game speed much faster than he ran at the combine, and he’s always is involved in just about every play. Great tackling technique, high motor, really like Paul Dawson at the next level. A two year captain during his time at Michigan, I was in love with Ryan going into the combine, and his success there only solidified him as one of, if not my favorite defensive prospect in this year’s class. Takes great routes to ball carries, probably the best tackler in this draft, and just plays with rare intensity. Plays faster than he may look, not very quick, makes up for lack of burst with his ability to take good routes to ball carriers. Reminds me of a smaller Brian Urlacher, high praise, but could live up to that comparison. 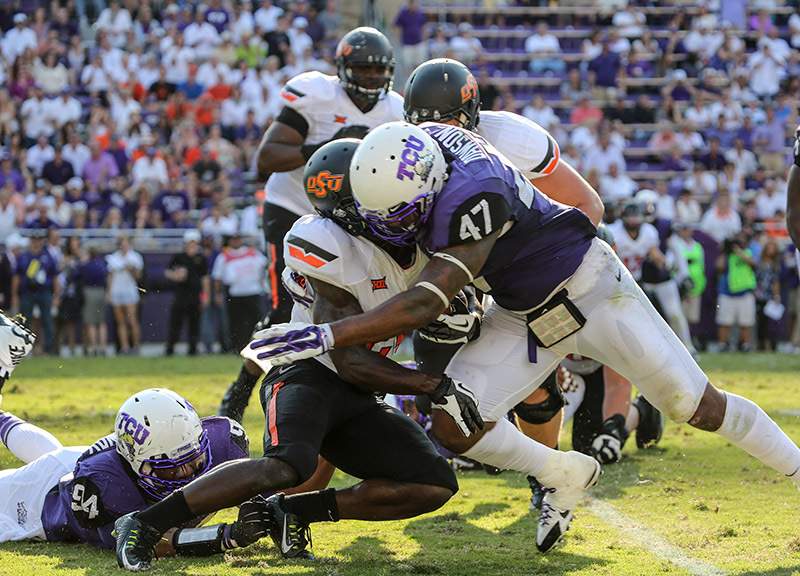 Thompson is a great tackler, with great closing speed, and can lower his shoulder and land the boom on ball carriers. Lacks ideal size and strength, which is why I’m not quite sure where to put him. Don’t think his money will be made as a linebacker, could be a blitzing linebacker, or could play some safety. He’s ranked number two solely on his athletic abilities, if he’s willing to try new things, he could have a long career in the NFL. Kendricks is a kid that I am not as sold on as many of the other analysts. He does play with rare speed and is one hell of a pass rusher, but I see holes in other parts of his game. For example, he shies away from really taking on opposing blockers, because of his lack of strength, would rather try to bend the corner and rely on his quickness. Decent in pass coverage, teachable with a high ceiling. Needs to get in the weight room more often, more athletic than strong, but makes up for lack of size with one of the highest motors of any of these top linebackers. Plays extremely well in coverage, which is rare coming out of college, does give up big plays in the run game due to his aggressiveness. With some time with a NFL strength and conditioning coach, Alexander could be molded into a very good NFL linebacker. 5t. Benardrick McKinney – Mississippi St.
Not many other linebackers are as versatile of an athlete as McKinney, especially not at his size, but his lack of initial speed and lack of awareness hurt his stock. When I look at an inside linebacker I look for a guy that has good instincts and football IQ, which where McKinney lacks as a player. Could be coached up into a decent player, but reminds me too much of Aaron Curry. Here comes the “are you stupid? Maxx Williams bro!” comments. Hear me out, Maxx Williams has a bigger route tree at the moment, but Walford’s ceiling is MUCH higher! This kid looks like a Julius Thomas clone, not to mention he’s got the catch radius as wide as a semi! Not a great blocker, but whatever team selects him will most likely want him to get outside and use his quickness to catch some touchdowns. Okay guys, see, I’m not so crazy after all. He is a nice athlete and plays with a rare motor, YouTube “Maxx Williams Mizzou” and you’ll see what I’m talking about. Runs a good route, and has the ability to catch the ball in traffic. He lacks explosiveness though, faster than he is quick. Not quite the match up nightmare that is Clive Walford. 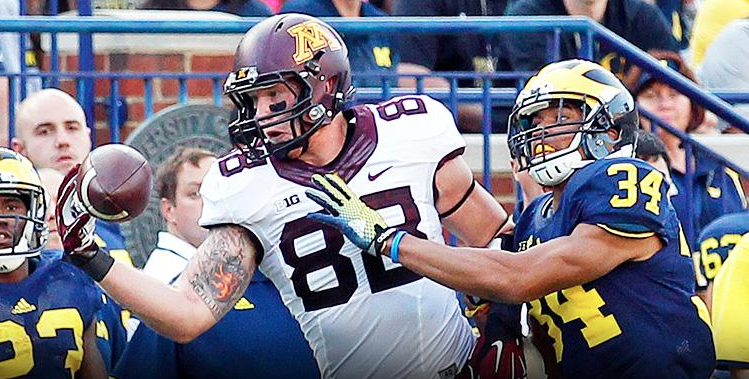 Will be a decent tight end at the next level, I like the Kyle Rudolph comparison. Very rare is it these days that you see a tight end that can be a game changer in the pass game, but can also be an asset as a blocker. What I find most impressive with Koyack is his ability to shed tackler after the catch, he runs angry, by that I mean that he is hell bent on getting extra yards and to get into the end zone. Needs to put on some muscles, but could be a nice add in the middle rounds. 4. Nick O’Leary – Florida St. I like Nick O’Leary more than most analysts. He doesn’t have that athleticism that some of the top tight ends do, but he does enough things well that he can be a safety blanket, just like he was for Jameis Winston at Florida St. He does have great hands though, but with his limited athleticism he won’t get any big gains in the passing game. Limited route tree and average speed will hurt his stock. This is a kid who at this point is more of an athlete than tight end at this moment in time. Good size and rare quickness, hard to bring down in the open field, needs coaching but could become a legit NFL tight end. Saxton will never be a great blocker, but has shown the ability to buy his quarterback some time with limited strength. More of a project, but worth a flier.